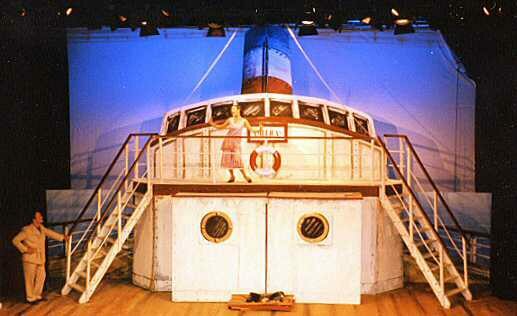 The Boat Deck of Liner "American" Photographed in the theatre. 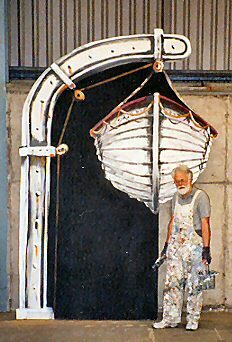 The two "boxes" in the front (With portholes on) swung open to reveal the "Cabins"
This stage has a raked auditorium so the eyeline of the audience changed depending upon their height above the stage - a dilemma when trying to paint a circular boat chimney. So for this scene I elected to do the perspective geometry for about five feet off the stage floor. Behind the stairs on both sides is a separate flat depicting the sea and the boat handrail. Not easy to see in this photo.The lines of the handrail and boat deck disappear at a vanishing point on an eye-level line of about 5 feet. Note just a little "dirt" on the edges of the main flats to make the Liner look lived in. The stage floor was painted to represent the decking boards. Trouble is, come the end of the show's run everyone else sets off for the "end of show" party leaving a few stalwarts to paint the floor back to its original black colour. And here is one of the two wings which were permanently either side of the above main set and well off to the right and left. (It's a thrust stage) Hard to visualise but they were about five feet higher off the stage floor on rostra hence the different perspective geometry. Sorry I appear so often in these photos but it's done for scale. Appropriately the scenery for this show was built and painted in a huge warehouse which is part of Coleraine river docks. CLICK for separate "window" showing the layout.